My Thoughts: To be interested and engaged with a book, the two most important things for me are a believable story line and relatable characters. If I cannot connect with a character on some level then I'm not invested in what happens to them. If I get bored, or don't really care about the story and it gets pushed back onto the bookshelf. Back into the never ending queue of books to read. When I first started reading this book I wasn't sure that I would connect with Lucy. There were several points in the book where she frustrated me. As I realized that her dreams and her love for her father fueled her I began to realize that perhaps there was more to this character than I had realized. What sold me on the story though, was Charlie. I loved him. I don't want to comment to much, because I don't want to ruin the story, but he was "real". He reminded me a bit of Robin Hood, a criminal with a heart of gold (not because he was a major criminal, mind you) but because of the positions he was put in. He had good intentions. What I like the most about him though was his journey of self discovery. He goes by Charlie, but transforms into Charles. While he works to reconcile these two very different people, Charlie must discover who he truly is, something that I can wholeheartedly relate to. I believe that I am the sort of reader that presents a challenge for authors. For a very long time, I have been sure of the kind of books, writing style, story lines and characters that I like and I stick with them. No books written in first person, and most definitely not a book with two different narrators. Too hard to follow, too hard to get invested. 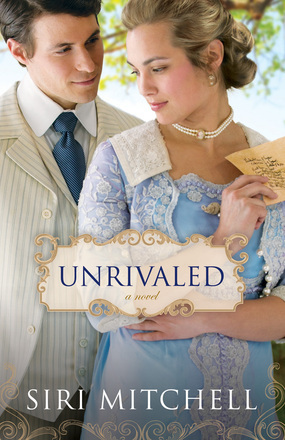 When I started Siri Mitchell's Unrivaled, I realized a few pages in that not only was this book first person, but it had two narrators and I was skeptical that I would enjoy it. But like a new piece of candy, you have to give it a chance. Because once you do, some wonderful flavor that you've never tasted may be worth every last calorie. Or in this case, every minute spent reading. While I don't think I'm a convert to first person- two narrator stories, I'm am a Siri Mitchell fan. Would I Recommend This Book? Unrivaled is a good story with one character I really enjoyed, and others that I liked. It was a good book. While it wasn't one of my favorites it is one that I would recommend if you're looking for a book with a Romeo and Juliet sort of story (with a MUCH better ending), with a character that reminds you of Robin Hood. It is a book that I will keep, and when there are less books on my to-read list, I might read it again.